SPACE HIJACKERS APPLICATIONS FOR PLANNING PERMISSION. Q. Whats the best way to annoy the architects, planners and dictators of the city? A. Pretend to be them, put up loads of planning permission applications for rediculous ideas, that could just be real and let the games begin. Ok so perhaps 35' watch towers in the city are a bit preposterous, but then a few months ago we thought that pedestrian lanes were a implausible idea. 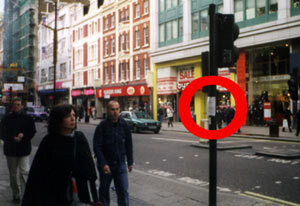 Then a group of Oxford St companies announced that they were planning exactly that, and hiring a pedestrian police to fine people £10 for walking too slowly. After checking out the layout and design of a series of offical planning permission notices, and setting up an email account, we started to produce our own. BROADGATE - CONVERSION OF THE CURRENT POLICE BLOCKADE AND SHELTER INTO A 35Õ WATCH TOWER ENABLING POLICE TO BETTER WATCH OUT FOR CRIME, AND SIMULTANEOUSLY PROVIDING NEARBY CORPORATIONS WITH A CAMERA POINT TO WATCH EMPLOYEES TRAVEL SAFELY TO AND FROM WORK. BT CENTER, ST PAULS - THE CONSTRUCTION OF A 100M PYLON FOR BRITISH TELECOM TO TRANSMIT A VARYING SIGNAL STATIC TELEPHONE FREQUENCY, ENABLING THEM TO BLOCK MOBILE PHONE FREQUENCIES OF OTHER NETWORKS WITHIN THE CITY OF LONDON. THE BANK OF ENGLAND - THE CONSTRUCTION OF A 15.9M X 14.7M ELECTROMAGNET HOUSED WITHIN A 3.5M PERIMETER FENCE. IN ORDER TO BE USED BY ANTI-CAPITALIST ANARCHISTS TO WIPE ELECTRONIC BASED COMPUTER STORAGE SYSTEMS WITHIN A 600M RADIUS OF THIS POINT. 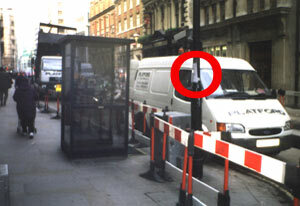 100 LIVERPOOL ST - A MAINS CONNECTED 7.6M X 14M METAL PLATE TO BE ATTACHED TO THE ROOF OF THE ENTRANCE OF 100 LIVERPOOL STREET AS A DETERRENT TO PIDGEONS AND ANTI-CAPITALIST ANARCHISTS ATTEMPTING TO SCALE THE BUILDING. BARBICAN - A 35Õ WATCHTOWER TO BE ERECTED ENABLING CITY OF LONDON SECURITY SERVICES TO GAIN A GRATER VANTAGE POINT OVER THE GENERAL PUBLIC. THEREBY INSTALLING A GREATER SENSE OF SAFETY, SECURITY AND CIVIC DUTY. 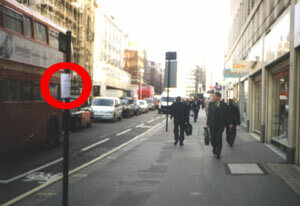 CHEAPSIDE - A PEDESTRIAN TRAFFIC LANE SYSTEM, INCLUDING A FAST LANE, LAYBYÕS AND HARD SHOULDER. THIS WILL RUN THE LENGTH OF CHEAPSIDE ON BOTH THE NORTH AND SOUTH PAVEMENTS. A TRAFFIC CONTROL FORCE WILL BE FORMED AND WILL BE GIVEN CONTROL OF THE EXISTING CCTV SURVEILLANCE SYSTEMS. PROPOSED TOLL BOOTHS WILL ALSO BE ERECTED AT EITHER END OF THE SCHEME. 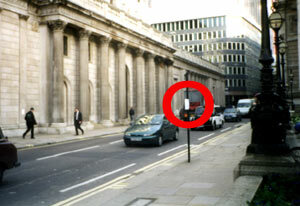 OLD BAILEY - THE CURRENT TRAFFIC ISLAND TO BE CONVERTED INTO A HOLDING PEN FOR CHILDREN OF CRIMINALS DUE TO BE TRIED AT THE OLD BAILEY. THIS WILL INCLUDE A ROOF AS A SHELTER AND GUARD BOX. OXFORD ST - A THREE STOREY DEVELOPMENT ACTING AS A TEMPORARY JAIL FOR PERSONS FOUND TO BE MISUSING THE PROPOSED PEDESTRIAN TRAFFIC SYSTEM, OR THOSE COMMITTING SPEED CRIMES. THIS WILL ALSO BE USED AS THE HEAD QUARTERS FOR THE PEDESTRIAN TRAFFIC POLICE, AND ACT AS A COMMUNITY CENTRE FOR THE DISTRIBUTION OF INFORMATION ABOUT LOCAL BUSINESS. The 7 day limit on responses was intended to further annoy readers of the notice, although we did still manage to get requests to see our plans from several solicitors firms.